Protests and scuffles erupted in the Czech capital Prague as Chinese President Xi Jinping arrived for a two days visit on Mar 28. (TibetanReview.net, Mar30’16) – Protests and scuffles erupted in the Czech capital Prague as Chinese President Xi Jinping arrived for a two days visit on Mar 28. Dozens of pro-Tibetan demonstrators, carrying Tibetan national flags, scuffled with well-wishers who had turned out to welcome the Chinese president, reported the AFP Mar 29. Earlier, Dozens of Chinese flags hung up in the streets of Prague ahead of Xi’s arrival were defaced with black paint. 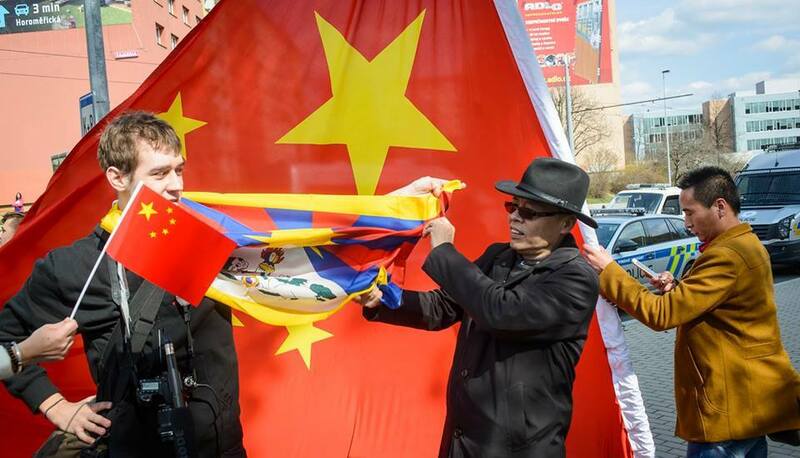 Although the ruined flags were quickly replaced, dozens of demonstrators on Mar 28 tried to hang Tibetan flags in their place, sparking scuffles with pro-Beijing supporters, reported the Czech news agency CTK. Police have been cited as saying they had arrested 12 people over the scuffles. The arrested people did not obey police orders, and some of them chained themselves to the lampposts, praguepost.com Mar 28 quoted police spokeswoman Andrea Zoulová as saying. The police had to call firefighters who took the protesters down from the lamp posts, she has added. The report said the Czech government’s flying of Chinese flags was not popular, with many people saying they were reminiscent of the communist era when pro-Soviet banners were seen in many public places. Shouting was also reported to have erupted in the park near the airport as Xi’s supporters covered up the Dalai Lama billboard with giant Chinese flags, sparking a heated argument with the pro-Tibetan demonstrators, the agency said. AFP said another rally against Beijing’s policy on Tibet was scheduled for Mar 29 outside the Czech presidential seat, Prague Castle. The late former President Havel, a hero of opposition to communist rule in his undivided country, was the first head of state to extend an official invitation to the Dalai Lama who visited the country during his presidency over 1989-2003. Xi is the first Chinese head of state ever to visit the central European nation. Visiting the county to promote trade ties and boost the two nations’ strategic partnership, Xi was met by Czech President Milos Zeman, who has considerably leaned towards China since he was elected in 2013. The Czech News Agency said Xi was bringing an investment of 45 billion Czech crowns (US$14.4 billion) to the country. Meanwhile, Forum 2000 Foundation, a Czech nongovernmental organisation, said it was going to open on Mar 29, with several other organizations, an information centre for democracy and human rights in China in Prague. “We would like to inform about the state of civic society in China and how human rights are respected in this territory,” ceskenoviny.cz Mar 28 quoted the forum’s spokeswoman Anna Vosalikova as saying. “We consider it highly important to give the (Czech) public an opportunity to come to know the other side (China), with regard to the deepening economic relations,” she has said, adding, “the information centre wants to mediate an open dialogue and provide unbiased information”. As the key part of Xi’s programme took place in Prague on Mar 29, Forum 2000 Foundation, joined by other organisations such as Post Bellum, Amnesty International, National Gallery Prague, Lungta and Potala, took part in the operation of the centre which organised lectures, round-table discussions and exhibitions. The centre said it was going to provide information on Hong Kong, Taiwan and Tibet, political prisoners, China’s relations with the neighbouring countries and the situation of ethnic and religious minorities.